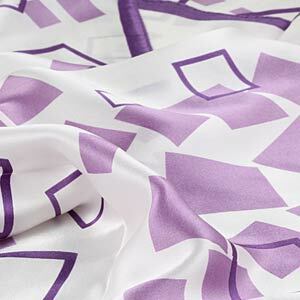 Wholesale Purple Border 50X50CM Printed Diamond Silk Scarves Natural Small Square Pure Silk Scarf-Wholesale Purple Border 50X50CM Printed Diamond Silk Scarves Natural Small Square Pure Silk Scarf wholesale, manufacturer and supplier of Wholesale Purple Border 50X50CM Printed Diamond Silk Scarves Natural Small Square Pure Silk Scarf from Yiwu China. Wholesale the smart-looking and fascinating 50X50CM Printed Silk Scarves Natural Small Square Pure Silk Scarf,designed in multiple patterns and colors are always the fashion trendy of the chilly winter. Follows are some of the fundamental and fashionable scarf folds which are usefull on how to tie a scarf. To start the basic folds, you will need a square shaped scarf and roll the scarf from one side to about the middle of the scarf. Bring the side of the scarf that you are rolling towards the other and completely roll the scarf towards the ending. The final product should look like the rolled scarf, a hotdog or logroll if you will. Fold one corner of the scarf towards the middle so that the scarf should look like a pentagon. Get the other opposite end of the scarf and fold it towards the middle, over the first fold to form an elongated hexagon.Pull the oblong scarf through belt loops and secure the sides securely. Firstly,you will need a square shaped scarf and fold the scarf in the middle to form a triangle. Hold the pointed end and roll it towards the center of the folded scarf then roll the other end towards the rolled portion. Completely roll the scarf to look like a hotdog whose ends are tapered. Certainly,you can also tie it just as it is that is just random,casual and sometimes maybe it will the Natural beauty and can be make you the trendy of fashion.